French interior minister Bernard Cazeneuve has extended the French state of emergency, which suspends key civil and human rights, in the aftermath of the gruesome truck attack on Bastille Day in Nice, which at this writing has left 80 dead and over a dozen in intensive care. As with the victims in Ankara, Istanbul, Dhaka, Baghdad, Beirut and Sousse, my heart goes out to them and their friends and relatives. Longtime readers know that I grew up partly in France and have a soft spot for the country, the people, and the culture. This hurts. Early unconfirmed reports suggested that the truck driver may have been a Nice native, 31, of Tunisian descent. The elite Paris counter-terrorism unit has been mobilized. But the fact is that most unfortunately, this kind of attack probably cannot be forestalled. No amount of surveillance or suspension of civil liberties could stop a single individual or small cell of close friends or relatives from committing a soft-target nihilistic attack of this sort. This crime has some resemblance to the murders of a serial killer, which are notoriously difficult to stop or solve. In an ordinary murder of the sort the detective or crime-solving mystery writers focus on, the police are said to look for “means, motive and opportunity.” But serial killers don’t have a specific motive, just a general one, that they get off on killing. A general motive is too vague and lacking in detail to provide any help to solving the case. That is why some serial killers can polish off dozens of victims over years before they are caught. They don’t know the people they kill, and have no ordinary motive to kill them. Nothing would show up in bank accounts or email files. For the victim, it is more like a natural disaster, like taking a mountain hike and running into a hungry black bear or accidentally driving into a tornado. Just as a nihilistic criminal such as a serial killer cannot easily be prevented from striking again, so a lone wolf and small-cell terrorist cannot easily be forestalled from wreaking havoc. I have argued that what Daesh is up to is not terrorism in the classic sense of killing civilians to accomplish a specific political goal or change some government policy. The driver of the truck made no demands. He did not hit an important piece of civilian infrastructure, but killed randomly, individuals attending a fireworks display in France’s fifth-largest city. If it was terrorism, he should have desperately wanted French President Francois Hollande to do something or not do something. What would that be, exactly? If it was terrorism, he should have hit a target of symbolic or strategic significance. You could take the position that Daesh is protesting the French air strikes on its capital, al-Raqqah, in Syria. But France only began those air strikes last September because it received intelligence that Daesh was planning to hit Paris (the intelligence was correct). So they had it in for France before that country was much involved in the Syrian civil war. The motivation must lie elsewhere. Since I made the argument that al-Qaeda and Daesh are ‘sharpening contradictions’ and trying to drive European Muslims into their arms by provoking white Europeans of Christian heritage to mistreat them, acknowledgment of that tactic has become a commonplace. So what to do? Daesh wants us to be afraid, to hate, and to push Western Muslims into their arms. The only effective riposte is Gandhian. Show Muslims some love, and include them in political society. No, Muslims aren’t peculiar in the amount of violence they have generated in the past century. And no, the religion of Islam does not permit terrorism; the Qur’an decries each murder as a form of symbolic genocide. France has a problem of slums around some of its cities, slums which are disproportionately African and Middle Eastern. Make them enterprise zones and site some factories there. Often the labor is not living where the jobs are. Social policy has to be implemented to close that gap. (The African and Middle Eastern labor often came to France in times of rapid economic expansion, when they were needed, but they got left high and dry by robotification or factory relocation. Here is another Gandhian proposal: Vastly expand economic aid to Tunisia. I don’t mean military aid, which is problematic since it strengthens the security forces over democratic institutions, and typically has few economic benefits to the recipient. I mean civilian economic aid and investment, which seems to be on the US side about $50 million a year right now. That is less than a single F-35 joint strike fighter jet. The US budget is $3.8 trillion, and foreign aid, contrary to what people think, is a piddling little part of it, especially once you get past Israel and Egypt. Tunisia overthrew a seedy dictatorship and has moved smartly toward more democracy– has in fact been an exemplary country in the Middle East. And the US can’t help out on the civilian aid and investment side even to the tune of one airplane. Why is this point important? Tunisia’s economic growth is anemic. In part, this slowing of growth derives from successful terrorism, which has harmed Tunisia’s tourism sector (5% of the economy). Its economy only grew by 1 percent in the first quarter, and the best it might do for this year is 2.5%. Last year it was 0.8%. Add in population growth, and the economic advance is zero or less. There have been massive demonstrations by youth protesting high rates of unemployment. And Daesh recruiters– guess what?– target unemployed youth. If the West can’t be bothered to proffer genuine and substantial aid to a success story like Tunisia, then it will get more basket cases like Syria, which spill over onto the West. And while the terrorist in Nice was French rather than Tunisian, the existence of a pool of Tunisians driven by marginalization, humiliation and desperation to join Daesh creates a nexus of potential recruitment. 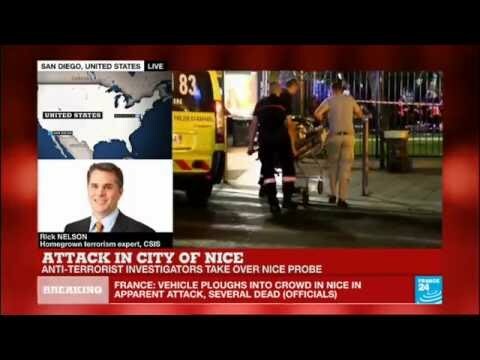 So the answer to Nice is the opposite of what the politicians think. It isn’t to declare war on Daesh (Trump), or to do more warrantless surveillance (HR Clinton), or to get rid of the Rights of Man (Francois Hollande). On Bastille Day, commemorating the French Revolution that helped invent the very idea of human rights, we should defend it by defending them, not by emulating dictators and absolute monarchs. To be fair, McDonough took this stance so as to be able to oppose arming the Syrian rebels and getting practically involved in the Syrian civil war. But both his and the CIA policy are wrong-headed. Prolonging the war by sending in weapons to Salafi jihadis creates more Salafi jihadis, and some of them hail from or go to Europe. Syria has become an infective agent in an epidemic of nihilist violence. And tolerating or promoting the prolongation of the war gives the militiamen more military and munitions experience, and more stockpiles, and more resources for planning attacks in the West. So that’s my prescription. You want to reply effectively to Nice? Reject fear and reject hate. Find a local Muslim and shower that person with love and respect. Speak out against Islamophobia. Work to strengthen democracy and inclusiveness and basic human rights. Stand up for the raid on the Bastille of 1789, and the freeing of prisoners of conscience. Invest some billions, not measly tens of millions, in success stories like Tunisia, to promote democracy and economic growth. And give John Kerry the backing and the resources to bring the Syrian civil war to an end. The standard politicians’ responses will just make things worse.